Trinity coach Chris Chester has made two changes for Wakefield’s Super League visit to Widnes Vikings on Friday. Chris Annakin returns from injury and is joined by Max Jowitt with Liam Finn and Matty Ashurst ommitted from the squad that lost 25-22 at Huddersfield last time out. Meanwhile, Tyron Travis is the latest academy player to sign with the first team after agreeing a one-year deal at Trinity. Travis, 19, joined the academy two years ago but has had a difficult start to his professional career. Head of youth Mark Applegarth explained: “Tyron caught everybody’s eye with his physical strength and direct carries. Unfortunately for Tyron his knees need some rehabilitation due to tendonitis which he has suffered from before he joined. “This contract will give Tyron some piece of mind and allow him to focus on not rushing back to earn himself a contract for next year. 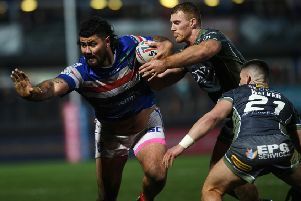 Wakefield Trinity (at Widnes): from Chris Annakin, Tinirau Arona, James Batchelor, Mason Caton-Brown, Anthony England, David Fifita, Ryan Hampshire, Keegan Hirst, Justin Horo, Tom Johnstone, Ben Jones-Bishop, Max Jowitt, Danny Kirmond, Reece Lyne, Jacob Miller, Pauli Pauli, Tyler Randell, Bill Toupou, Kyle Wood.